KOMONO is a brand that recently got my attention. I first spotted their watches & sunglasses at JAN which is a fun & trendy store in Amsterdam. Their designs are both simple but trendy. It's also very good quality for a decent price! I love the fact that their collection looks expensive, but is actually really affordable! Hello perfect . If you like to buy a watch or sunglasses that are timeless and you’re on a budget, well than KOMONO is the brand for you ! The yellow watch is the perfect example of a timeless design with a trendy touch. This one is high on my wishlist. Since I first saw them in Amsterdam, it looks as if this brand is really booming. 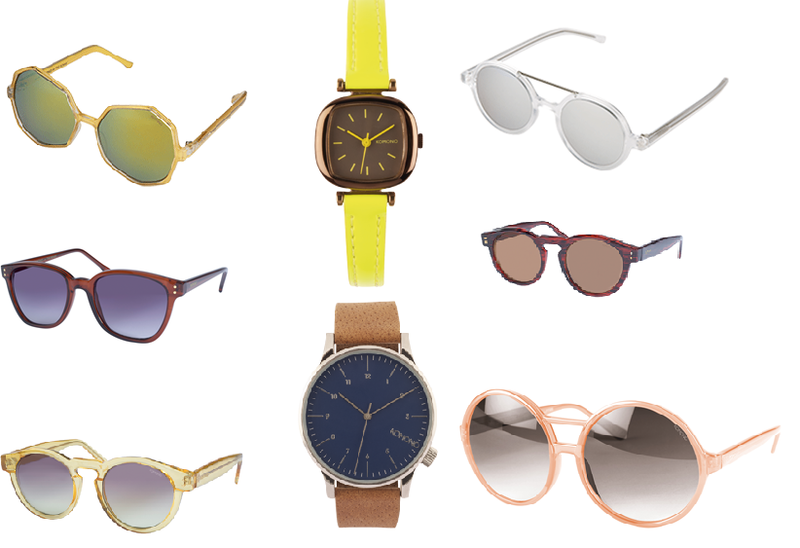 Everyone is wearing KOMONO watches or sunnies lately. KOMONO is the next big thing, so keep an eye on this über trendy brand! I’ve gathered some of my personal favorites which are shown in the picture above. You can find them on ASOS, KOMONO website or JAN (Amsterdam). Ik hoop ook een paar in mijn bezit te krijgen binnekort! Wow I love this brand! Affordable too!